NSA PRISM program: Can we trust the government with our secrets? No. The government almost always abuses its surveillance powers. That should trouble every American citizen. 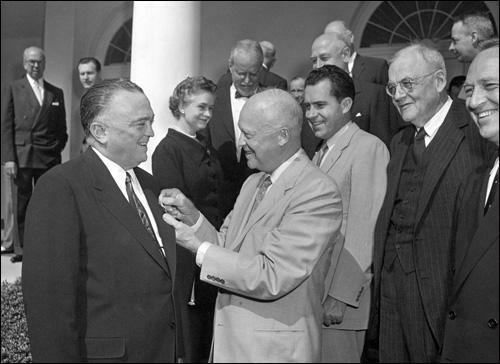 FBI Director Hoover receives the National Security Medal from President Dwight Eisenhower on May 27, 1955, as Vice President Richard Nixon and others look on. To say that the expansion of surveillance powers comes with a high—and historically well-documented—risk of abuse is not to say that the NSA is interested in your cat photos. If you’ve never expressed an edgy political idea, you’re probably not at great personal risk. The people swept into the net at moments of expanded intelligence powers have almost always been outspoken political dissenters or critics of the intelligence establishment. The basic premise of the civil libertarian stance is that what happens to those people matters to all of us—not only because “we might be next” but because the free exchange of political ideas and criticism is the heart of American democracy. So that’s the principle: Democracy requires protecting unpopular speech, and state surveillance tends to make people quiet. Then there’s the more practical side of things. In the past, when intelligence agencies have gained broad, unfettered powers, they have often used those powers not to protect the country but to protect themselves. J. Edgar Hoover’s FBI stands as the example par excellence—an extreme but not fundamentally exceptional case of intelligence gathering gone awry. Last week I wrote a bit about COINTELPRO, the FBI’s notorious program of surveillance and disruption against targets ranging from Students for a Democratic Society to the Ku Klux Klan. But there’s another side to the FBI’s history of abuses—one that has less to do with attacks on political “subversives” than with the agency’s response to its mainstream critics. The interview had nothing to do with national security or even political dissent. But FBI agents didn’t necessarily view it that way. Charged with protecting American democracy from existential threats, they often saw themselves as a noble vanguard, possessed of secret, high-stakes knowledge, performing dangerous tasks that nobody else would or could. In this context, protecting the country meant protecting the FBI’s institutional power, and that meant protecting Hoover. If agents had qualms about this, there was little room to express them. To seriously criticize FBI policy, an employee would have had to do what NSA whistleblower Edward Snowden just did: give up a prosperous, interesting career and risk the wrath of a huge intelligence apparatus. Even outside of the bureau, Hoover exercised powerful forms of control over potential critics. If the FBI learned a particularly juicy tidbit about a congressman, for instance, agents might show up at his office to let him know that his secrets—scandalous as they might be—were safe with the bureau. This had the predictable effect: Throughout the postwar years, Washington swirled with rumors that the FBI had a detailed file on every federal politician. There was some truth to the accusation. The FBI compiled background information on members of Congress, with an eye to both past scandals and to political ideology. But the files were probably not as extensive or all-encompassing as people believed them to be. The point was that it didn’t matter: The belief alone was enough to keep most politicians in line, and to keep them voting yes on FBI appropriations. The same held true for members of the media. A critical column inevitably earned its author an FBI file. It might also come with a variety of other consequences. In 1936, when the famed columnist Westbrook Pegler mocked the FBI as a group of show-boaters, Hoover immediately removed him from the bureau’s media contact list, complaining that Pegler suffered from “mental halitosis.” Though Hoover and Pegler later reconciled, the FBI maintained a file on him for decades, just at it did for dozens of other media figures. Under this system, damning information could be leaked to more hospitable reporters (conservative columnist George Sokolsky was a particular favorite) or held for use at some future date. One would hope that today’s NSA has better things to do than investigate its critics in the media, and that the safeguards now in place—congressional oversight committees, FISA courts—have in fact curtailed the kinds of abuses committed at Hoover’s FBI. But make no mistake: Those abuses occurred, and under the right circumstances they can occur again.